In 1914, Cawker City hosted the semi-annual Mitchell County Old Settlers Reunion. 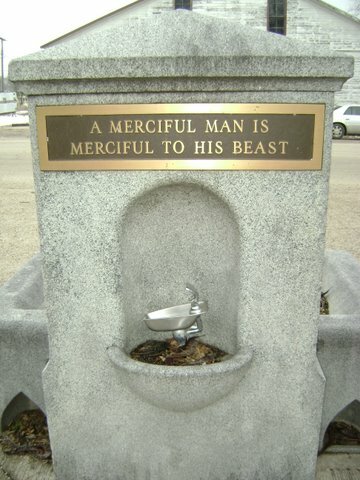 Centerpiece of the celebration was the dedication of a "monumental drinking fountain," a gift of Miss Lenora Cawker of Milwaukee, Wisconsin, in memory of her father E. Harrison Cawker, who founded the town in 1871. Cawker won the right to have the city named after him in a poker game. This fountain got the community started on creating the City Park. The fountain is on the west side of the Park on Lake Drive. Miss Lenora had a personal love for animals both great and small, thus the granite, decorative but functional fountain. Check out the small bowl of water for dogs and cats found on each side of the drinking fountain.